Fail Fast. Fail Often. Be Courageous. I often see clients who are afraid to take that big step forward. They want to know exactly what is going to happen. They are stuck in paralysis because they want to analyze the situation until they figure out every possible scenario that may happen. They are afraid, they may fail. They think if this fails, I’m a failure. This is not true! If the action failed, it doesn’t mean you are a failure. Instead this courageous movement means you took brave action to change course. I’ll share how this has played out in my life. The past two weeks, I’ve been bold – creating and crafting – thinking big. Yet, I had two setbacks. The first, I accidently sent 6 emails simultaneously instead of 1 email to folks who heard me speak. Talk about embarrassing! The second, I submitted for a coveted TEDx talk. Hitting that send button was a huge step for me. I was soooo excited only to learn I didn’t get selected. Here’s what I gained and learned in the process. The more I go for those big, scary steps, the more courageous I get, the more willing I am to take the step into what’s possible. I figured out how to make my systems work. And, the talk allowed me to craft language that was rattling in my head and put it into a cohesive, readable text. In the end, I didn’t fail. I learned and grew. Where can you learn from past experiences? What courageous leap will you take this week? Do you want to learn how to be more courageous? Join me for a complimentary session. 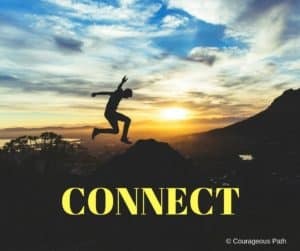 How Do You Truly Connect With People? Humans desire interaction and connection. Some may like interactions more than others but we can agree we all desire connection in some form or another. Connection is not just about engaging with others. It’s also about connecting with ourselves. If we don’t know who we are, where we want to go, or understand what’s going on within our internal dialogue, how can we truly relate to someone else. How can you be present and listen when there’s 900 things meandering in your mind? Instead of disconnecting, let’s truly connect to ourselves and with others. Take a minute today and let someone you know you care or what they mean to you. Wishing you a loving, peaceful, and joyful day! 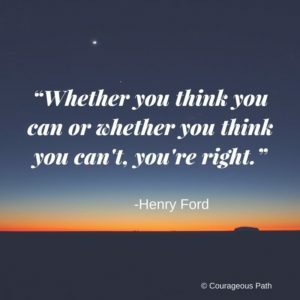 I love this quote from Henry Ford. It exemplifies what mindset is all about. Thinking you can is the first step in laying the foundation of your dreams. The second step is taking the courageous action towards your dream. Then you begin to lay down your courageous path foundation. Let’s look back on this week’s events. No matter if you watched the Super Bowl or not or what team you routed for, we can agree the 20+ point comeback by the New England Patriots was spectacular. It was all about mindset. The Patriots thought they could come back. And, guess what, they absolutely did! Where in your life right now, do you need a comeback? Where do you think you CAN do something? We often seek the external validation of others for our brilliant ideas and actions. Instead, believe in your own capabilities to figure it out. Thinking you can is half the battle. Go forth this week and do something unbelievable.